Kathy and John Didkowsky have been leading hiking tours in Switzerland since 1994. They are knowledgeable, trained and will always put your safety first. From the moment you book your tour until you get on the plane for home, you are in capable hands. 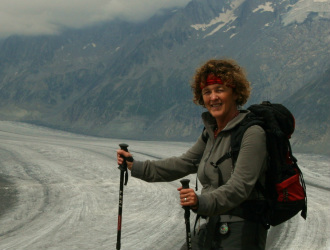 Kathy has taken several mountaineering safety courses and learning from the local mountain guides, she knows every stone along the path and can take you to the hidden gems of the Alps known only by the locals. As a Switzerland expert, she also has knowledge of all four cultural areas of Switzerland which guests can take advantage of on those days off from hiking. Kathy is a three time winner of the Golden Flower Award from the Switzerland Tourism association for her contribution to tourism in all of Switzerland. When you choose to book a tour with Spirit Adventure tours, you can rest assured that you are in good hands, that you will have fun, get to know the people in your community and that your safety will never be compromised. John, an engineer by profession, pays attention to details, sharing his love of the mountains and his vast knowledge of the area with guests. Both Kathy and John have been recognized by the Kandersteg tourist office for their contribution to tourism in the Berner Oberland. John, known endearingly as the "tail gunner", is constantly on the watch for anyone who may be having difficulty with a climb, offering encouragement and support. Nora Didkowsky is a strong, energetic member of our guiding team. She brings positive encouragement to the hikers, giving them confidence and reassurance that they are being well looked after.